The era of Dutch colonialism in Indonesia began in 1603 with the Dutch East India Company arriving in the Indonesian Archipelago. The reasons for the arrival of the sea-faring Dutch was trade and money. The spices that were available in the Indonesian Archipelago were high in demand. Now the Dutch East India Company, the VOC, was a trading company. It has been commonly considered the first multinational corporation. Here’s a crash course in history that better explains how the dutch arrived in Indonesia. Upon setting up base in Java, the Dutch established a de-facto capital in Jakata (then called Batavia). 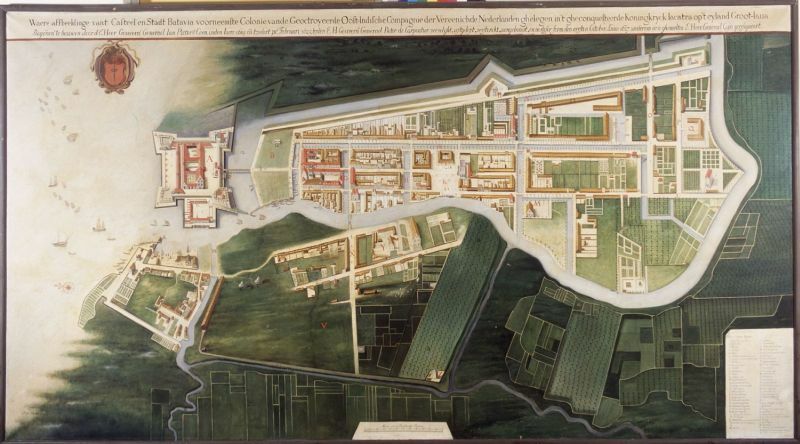 Here is a map of the City of Batavia in 1627. After a period of growth and decline the company was eventually dissolved and in its place was a ‘nationalised’ colony. The picture above refers to what is today called Kota Tua, or Old Batavia.